438, Lot: 21. Closing Feb 20, 2019 at 10:07:00 AM ET. SICILY, Gela. Circa 420-405 BC. Æ Onkia (11mm, 1.10 g, 10h). 438, Lot: 57. Closing Feb 20, 2019 at 10:19:00 AM ET. MACEDON, Akanthos. Circa 430-390 BC. AR Tetrobol (15.5mm, 2.25 g). 438, Lot: 58. Closing Feb 20, 2019 at 10:19:20 AM ET. MACEDON, Akanthos. Circa 430-390 BC. AR Tetrobol (14.5mm, 2.35 g). 438, Lot: 81. Closing Feb 20, 2019 at 10:27:00 AM ET. EPEIROS, Symmachy. 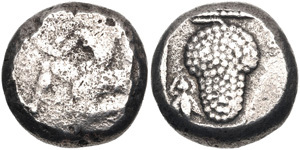 Circa 297-270/65 BC. Æ (24mm, 8.91 g, 9h). 438, Lot: 84. Closing Feb 20, 2019 at 10:28:00 AM ET. THESSALY, Larissa. Circa 462/1-460 BC. AR Obol (9.5mm, 0.76 g, 2h). 438, Lot: 90. Closing Feb 20, 2019 at 10:30:00 AM ET. THESSALY, Pelinna. Late 4th-3rd centuries BC. 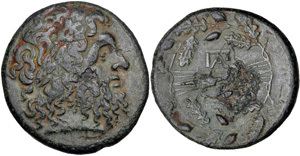 Æ Dichalkon (16mm, 6.02 g, 11h). 438, Lot: 93. Closing Feb 20, 2019 at 10:31:00 AM ET. THESSALY, Skotoussa. Mid 4th century BC. 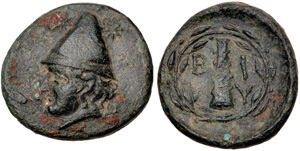 Æ Trichalkon (21mm, 8.04 g, 9h). 438, Lot: 129. Closing Feb 20, 2019 at 10:43:00 AM ET. PONTOS, Amisos. 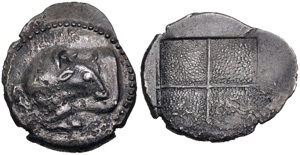 Circa 100-85 BC. Æ (30mm, 19.62 g, 11h). 438, Lot: 136. Closing Feb 20, 2019 at 10:45:20 AM ET. TROAS, Birytis. 4th-3rd centuries BC. Æ (19mm, 4.71 g, 3h). 438, Lot: 170. Closing Feb 20, 2019 at 10:56:40 AM ET. CILICIA, Soloi. Circa 440-410 BC. AR Stater (18mm, 10.84 g, 7h). 438, Lot: 197. Closing Feb 20, 2019 at 11:05:40 AM ET. SELEUKID EMPIRE. Seleukos II Kallinikos. 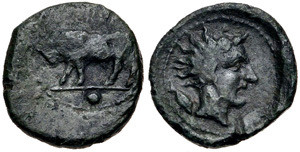 246-225 BC. Æ (17mm, 3.94 g, 12h). Sardes mint. 438, Lot: 226. Closing Feb 20, 2019 at 11:15:20 AM ET. PHOENICIA, Arados. Uncertain king. 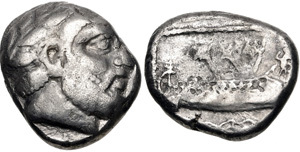 Circa 370-346 BC. 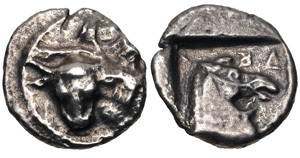 AR Shekel (18.5mm, 9.72 g, 4h).